Site A9. 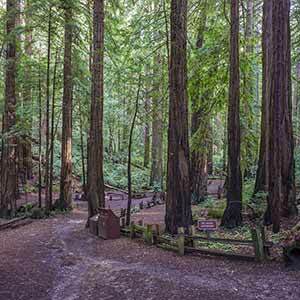 The A loop has the biggest redwoods but also the most stumps. 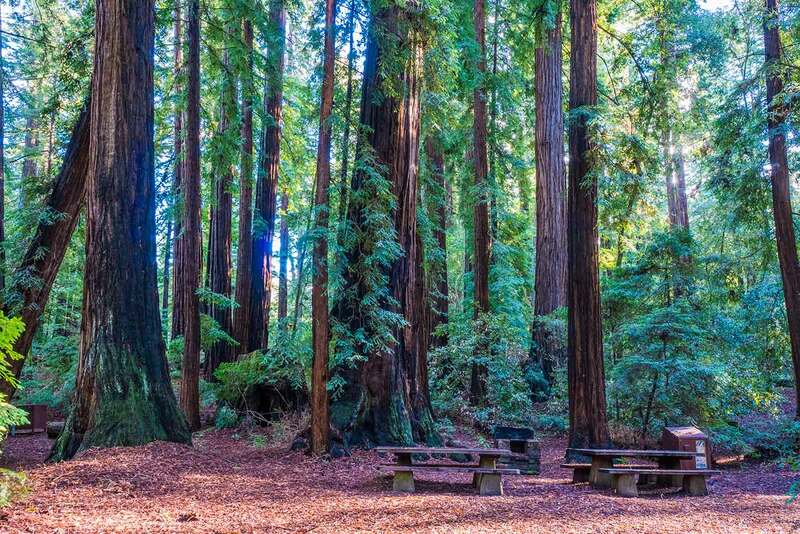 Memorial County Park is a great base if you want to escape the summer heat, explore the coast, and munch on artichoke bread under the deep shade of the redwoods; maybe less so if you want to go all John Muir and be one with the untrammeled wilderness. 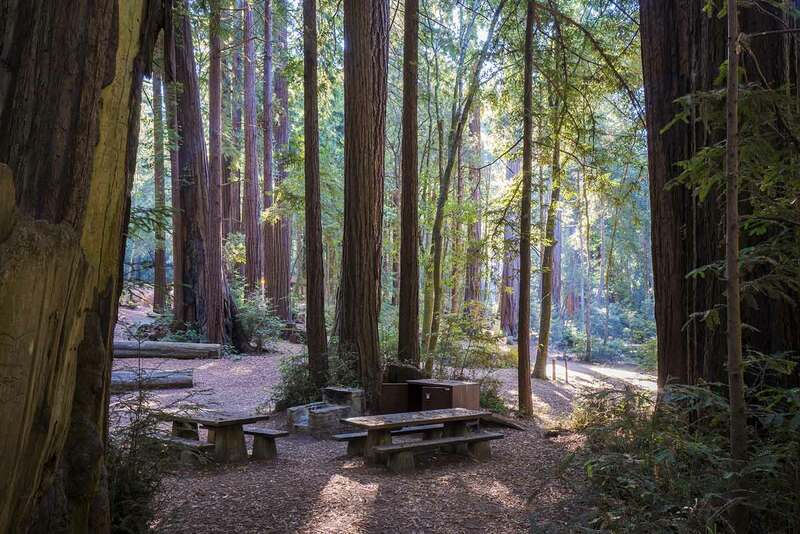 It’s really quite a scenic campground; set in a stand of redwoods that’s in excellent if not pristine condition, it feels very similar to the old-growth campgrounds of Big Basin. 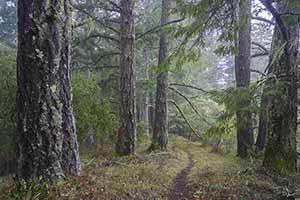 Many areas have only a few scattered stumps and are in nearly old-growth condition. 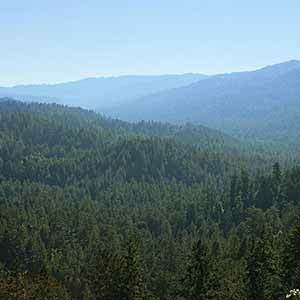 However, the most impressive areas, especially the A loop of Sequoia Flat, are also the most heavily logged; it looks like the biggest and straightest redwoods were selectively cut before the park was acquired in 1924. 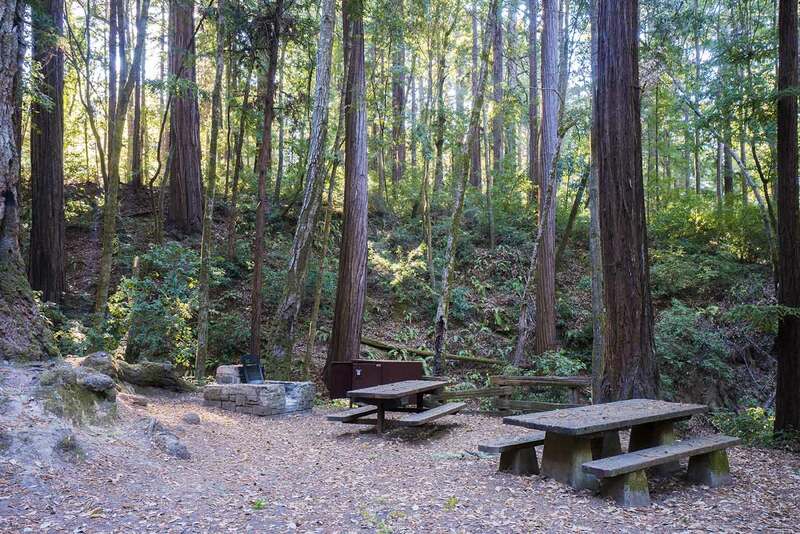 The main drawback of Memorial County Park is that it doesn’t feel quite as connected to nature as smaller campgrounds like Portola or Butano. 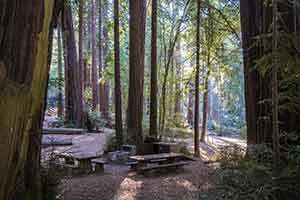 The campground, the largest on the peninsula, is heavily developed; every bit of available space between Pescadero Creek and Pescadero Road is used for campgrounds or picnic areas. 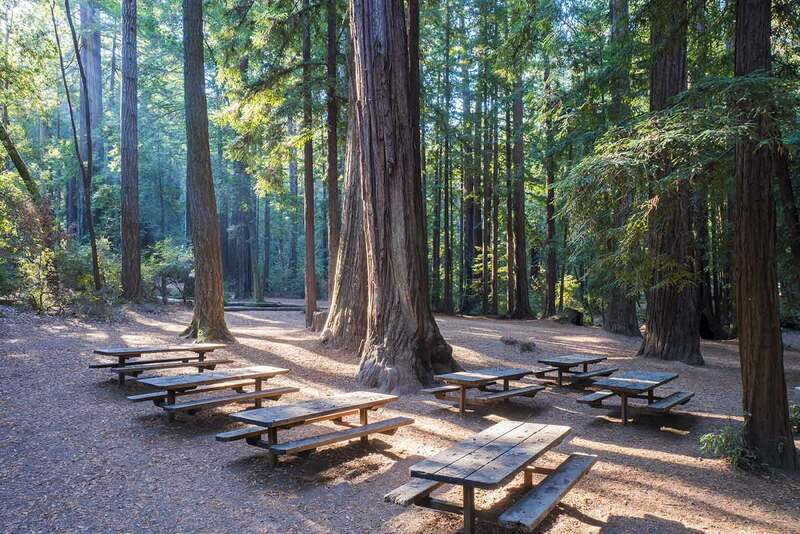 The campground itself feels fine, but if you want to go for a short walk there aren’t a lot of really good options unless you go to one of the neighboring parks. 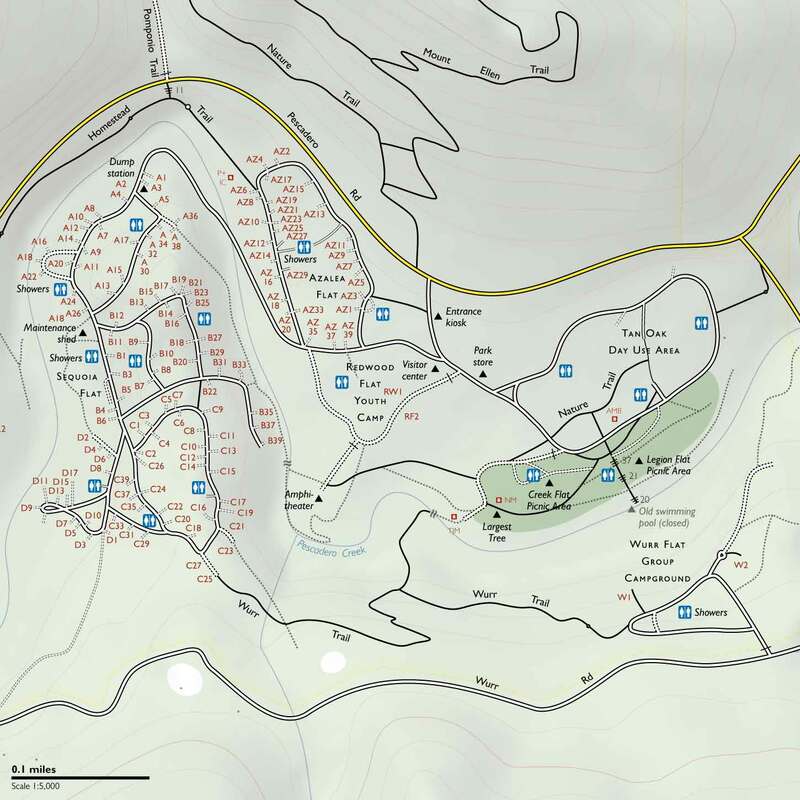 Mainly that’s because outside the campgrounds, and especially around the day use areas, Memorial has a lot of old, deteriorated development. 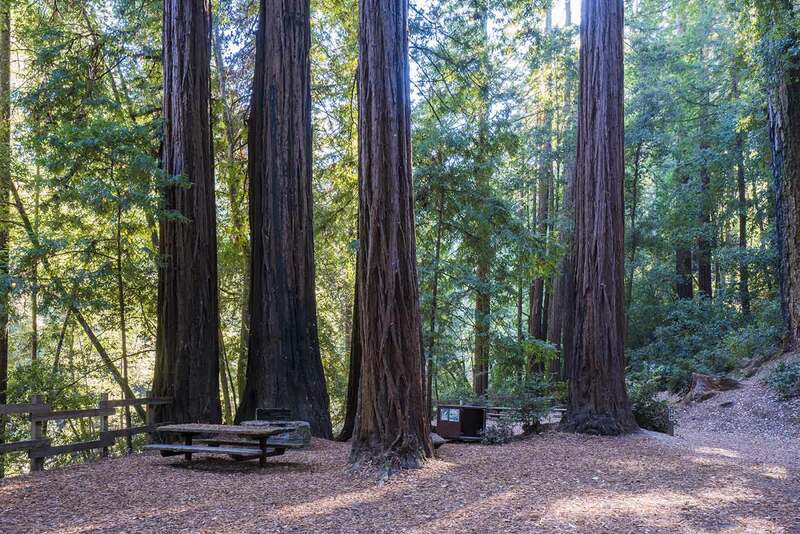 In a way Memorial is a throwback to 1930s campgrounds like Big Basin, Mariposa Grove, and Sequoia National Park, all of which used to be pretty densely packed; those parks were eventually restored to a more natural state. 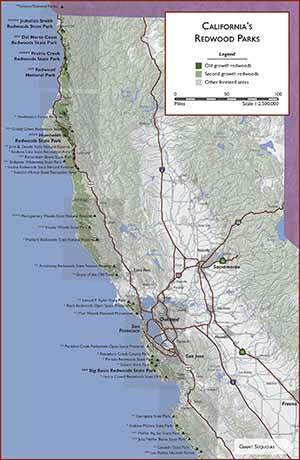 The campground is ideally situated between the inland heat and the cold, foggy coast. There’s a lot to do in the area; it’s about a 20-minute drive to the remarkably well-preserved coast with its state beaches, farm stands, and lighthouse. The nearby tiny town of Pescadero has a pretty good grocery store where you can find the aforementioned artichoke bread, and the wildly popular Duarte’s Tavern, which looks like it hasn’t changed since the 1930s. 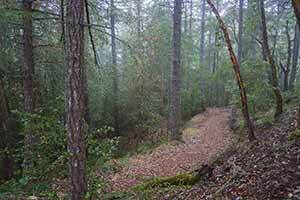 For a 2 – 5 mile hike, the Mount Ellen Loop is just across the street; for an all-day hike, the excellent Butano Ridge loop starts about a mile from the campground. Large trailer (LT) are for RVs up to 35 feet and cost $40/night + $13. There are no RV hookups. The different kinds of sites are randomly scattered around; the best way to tell which is which is to use the county’s reservation page. 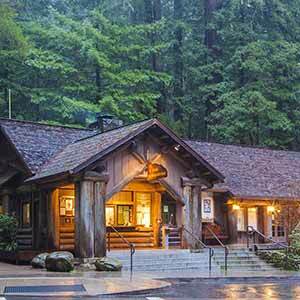 Reservations can be made up to a year in advance, and there’s a 3-night minimum stay on holiday weekends. Overall the C loop is the best. 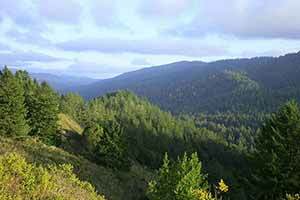 The redwoods are smaller here, but the loop is on a hillside with lots of huckleberry shrubs, so the sites are better screened from each other by vegetation and the hill itself, and it’s far from Pescadero Road; there’s some traffic noise, but it’s minimal. 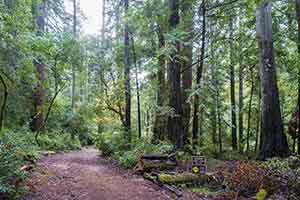 Site C25 is the best; it’s a big no-trailer site set back from the loop road, in a redwood-filled ravine that offers isolation from the rest of the campground. It can be a little dark, though. C27 is similar but is closer to the loop road. 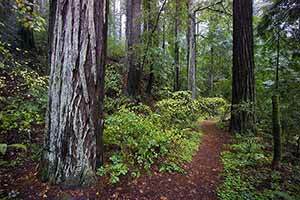 The A loop has the most impressive redwoods, but half of the loop (sites A13, A15, A17, A32, and A34) has been heavily logged and the other half is the main entrance road for the campground. 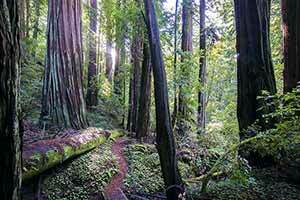 Still, the tall, straight old-growth redwoods that remain have a remarkably striking beauty. 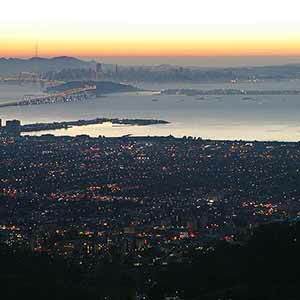 Azalea Flat is the least popular area, since it gets the most traffic noise. 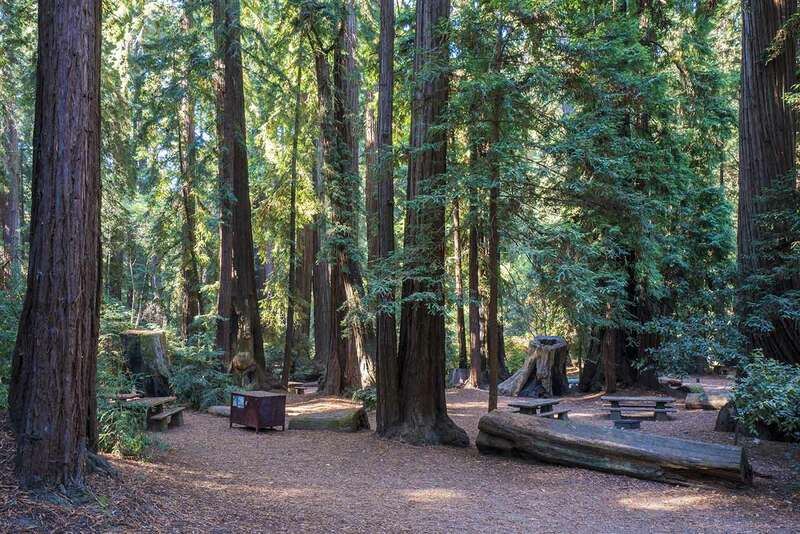 However, from November through mid-May it’s the only part of the campground that’s open, since there’s no bridge across Pescadero Creek to the other campsites. 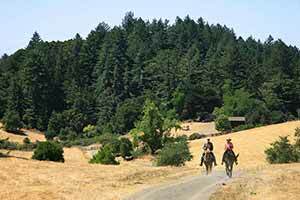 The campground has pay showers, although they’re sometimes closed due to droughts. 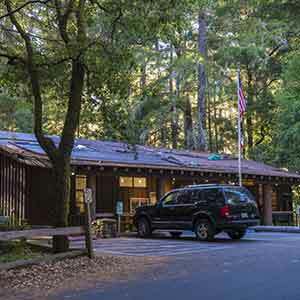 In summer there’s a park store that’s run by the same people who run the grocery store in La Honda. It has packaged snacks like potato chips; soft-serve ice cream; and camping supplies like bug repellent. 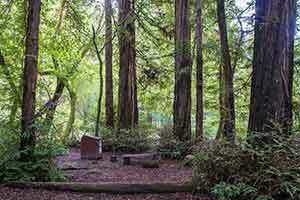 Reserve sites through San Mateo County Parks. 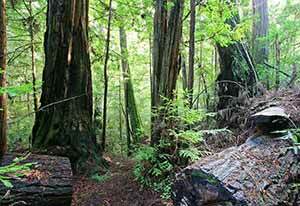 Site C27 has smaller redwoods but is in a secluded ravine.